All logos and covers ©Big Entertainment, Inc. Anyone remember Tekno Comix? 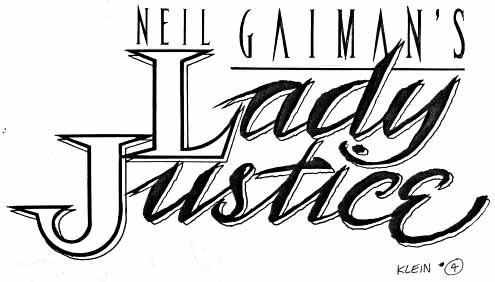 In 1994 I was approached by editor Ed Polgardy to design two logos for their Neil Gaiman titles: TEKNOPHAGE and LADY JUSTICE. 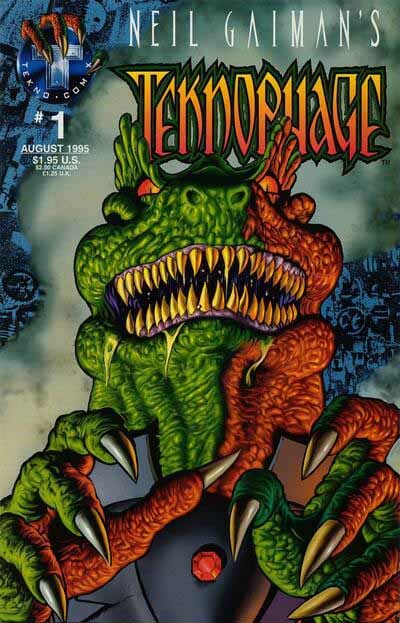 Neil would probably be happy to forget about his involvement with the company, since his only input was, I believe, an initial overview and outline for the characters, but actually I quite liked the TEKNOPHAGE book written by Rick Veitch with art by Bryan Talbot. It’s always tough to sell a villain as the main character, and the lizard Teknophage was a most horrible villain, but so much so it was fun to see how the stories would progress, how the protagonists could even survive encountering him, let alone triumph over him. These sketches were all done in marker, not long before I got my first Mac computer. The first one, above, is nicely jagged and scary, but hard to read. Also somewhat reminiscent of the logo I designed earlier for Sabretooth, and then at Marvel’s request adapted for Spider-Man. This one is also rather hard to read because it’s so elongated. Put your eye out on those points, couldn’t you? It did echo the treatment of Neil’s name well, though. 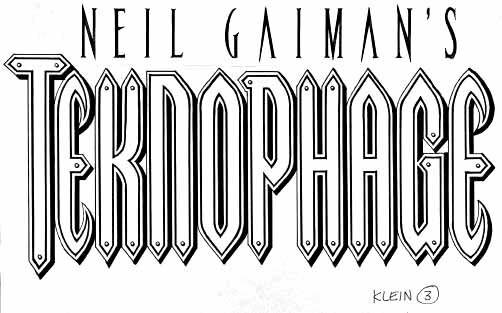 This is the one I thought they’d go for: easy to read, has a steampunk feel that they were going for. Looking at them all now, the one I like best. But in fact they went with this fourth one that I kind of threw in expecting they’d also find it too hard to read. Just shows you can never figure. Here it is on the cover of the first issue, with great art by Bryan Talbot and even better coloring by Angus McKie, I believe. It actually reads better in color than I expected. 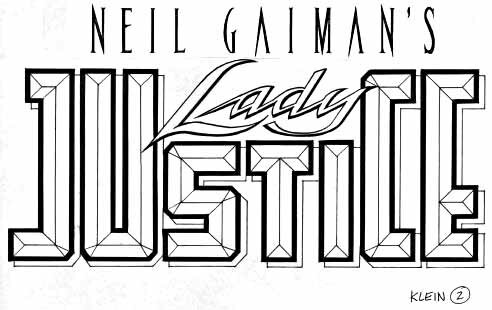 Lady Justice was a more difficult design concept. For Teknophage I only had to make it scary. 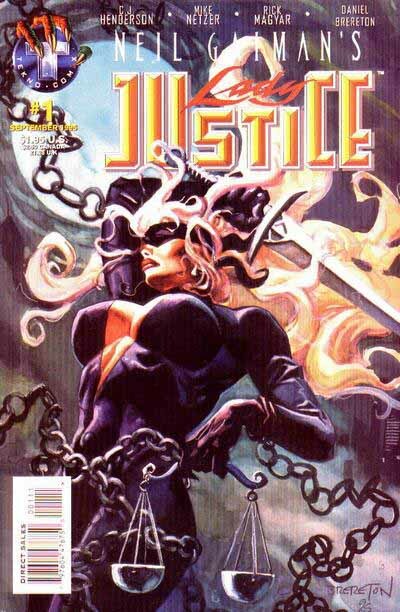 Lady Justice needed to combine ideas of a female super-heroine and something edgy and different, “Vertigoesque” I was told. This first one is certainly different, with lots of interesting curves and points. Maybe too different. Note this is marked 1A, so there must have been an earlier version that I didn’t save. 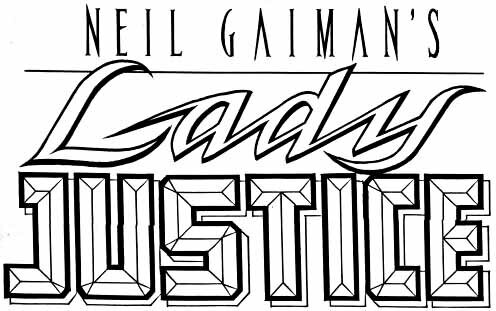 Version 2 focused more on the superhero angle with strong bevelled forms for the “Justice”, and a pointy script “Lady” for contrast. They weren’t crazy about the different heights on “Justice,” though. Version 3 looks rather odd to me now. The angle of the letters makes it seem to be falling over to the left. The narrow forms allowed the full name on one line, and I spaced them out for better reading. There might have been problems putting this over busy art, though. This one’s rather a mess. Not a good combination of styles, and the whole thing is unbalanced. This is much better with the full name in the same script. I think this captures the “Vertigoesque” request pretty well, but none of the superhero angle. They asked to see another version of 2 with JUSTICE all the same height and LADY large above it, which I created with some resized copies and cut and pasting. Not too bad, but I think LADY is too large in this one. They must have agreed, and went with version 2 as originally sent in. Here it is on the first issue’s cover. Works okay, I guess. 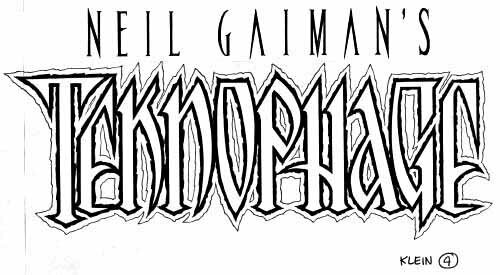 Neither of these logos are among my favorites, though the TEKNOPHAGE one did grow on me. 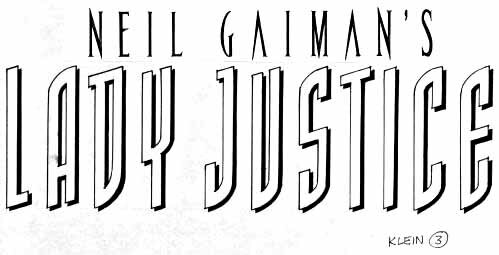 I also designed one for the WHEEL OF WORLDS one-shot that set up the interconnected Neil Gaiman books. I think with that one I got it in one sketch. Tekno Comix didn’t last too long. A victim of the boom and bust, and there were some management issues as well, from what I’ve heard. I think a collection of the TEKNOPHAGE run by Veitch and Talbot would sell now if reissued, though. This entry was posted in Logo Studies on February 16, 2008 by Todd. I passed on the Tekno Comix stuff when it first came out. I’m a big fan of Rick Veitch, so I’ll keep an eye out for those Teknophage issues next time I’m digging through the bargain bins. “Management Issues” is an understatement. I will say, though, that the editorial staff sincerely tried to make good comics under some extremely difficult conditions. More than a decade later, I still have anxiety nightmares about working at that place. 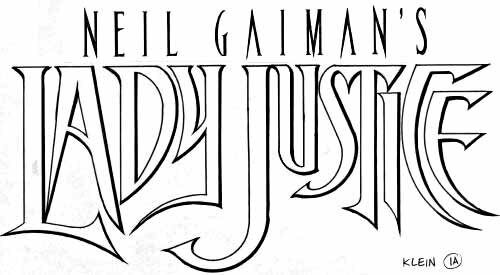 — Former editor of LADY JUSTICE. Good to hear from you, Christopher! 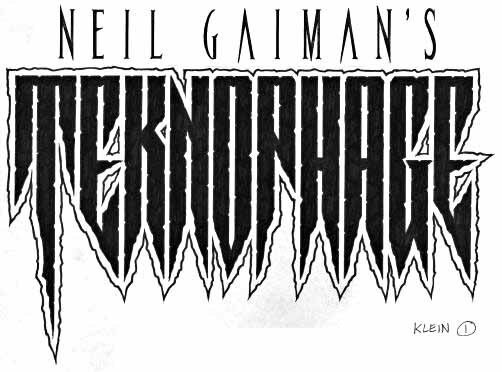 Teknophage turned out to be a really enjoyable story, and the art on it was fantastic. It’s a shame the same can’t be said for Lady Justice and Mr. Hero. Teknophage is one I still go back to every now and then, though. 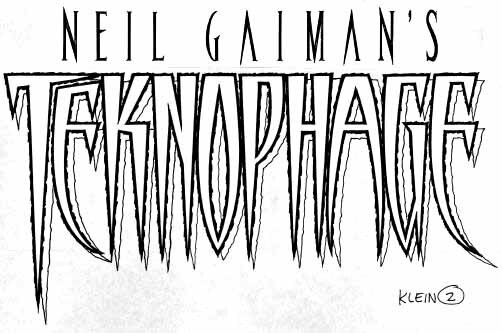 Did you have a hand in designing the treatment of Neil’s name on those covers? I think it worked really well. Yes, I did Neil’s name as part of the logos. Thanks!